and in thee shall all families of the earth be blessed." And Abram does. He packs up his wife and heads out. He lives in tents in the wilderness, amidst his flocks and the servants (whom we learn later LOVE Abram and choose to follow him even with death on the line). And YHWH blessed him and all he had. His flocks multiplied, his wealth multiplied, they were healthy and secure. Whenever someone did attack him and take from him, Abram was given great victory. He regained ALL his belongings and the people that belonged to his household. He also gained an enormous amount of loot above and beyond what was taken from him. We know for some time though, Abram and Sarai had heaviness in their hearts regarding a child. While they were blessed greatly.... with no child of his own, what did it matter? In just a matter of years, Abram's name and fortune would be lost to the wind because he had no heir. In chapter 17 YHWH changes Abram's name to Abraham, Father of Many Nations. And YHWH tells him that Ishmael, who is not the son of his wife, is NOT going to be his heir. 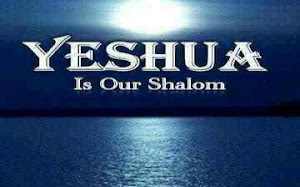 In Chapter 18 Verse 1 we read..... "And YHWH appeared to him..."
Why He is none other than Yahshua!!! Recall His 'shem', the Hebrew word meaning Name and Reputation. And as He said of Himself in John 8:58, "Yahshua said unto them, Verily, verily, I say unto you, Before Abraham was, I AM." Is this the only time that He appears before men in the Old Testament? NO! Daniel also saw Him face to face in Daniel 10:5-6. Note the description of this man compared to Revelation 1:13-15. But his appearance to Abraham was not so. He appeared... just as a man, much as he appeared to Jacob in Genesis 32:25-30. Of course Abraham still recognized this visitor, by the authority of His conduct. He graciously accepted to sit and sup with Abraham. And immediately promised that Sarah would bare a son within a year.